Features | Hy-Grade Valve Inc.
HY-GRADE's flapper and shaft are designed as an integral component with large diameter shafts to provide strength at a critical location. In contrast, typical check valves have multiple components which are assembled together using bushings, nuts, bolts, and hinge pins. Over time these multiple components tend to come apart leading to valve failure. HY-GRADE's integral flapper and shaft design has a long and proven history of providing reliable service in the harshest of applications. HY-GRADE's Large Unobstructed Bore provides maximum flow capacity with extremely low pressure drops. The unobstructed bore also allows HY-GARDE check valves to be used in slurry, high consistency or abrasive applications. The flapper/shaft component is housed in a retainer slot which allows the flapper to swing freely without the use of journals and bushings. This allows the flapper to cycle closed without interference and the line pressure is distributed evenly across the flapper for a 360° positive seal. A double wound torsion spring assists the flapper closure for instant sealing and anti-chatter operation. The spring is securely held in the valve body on an independent pin and is completely shielded from the flow. 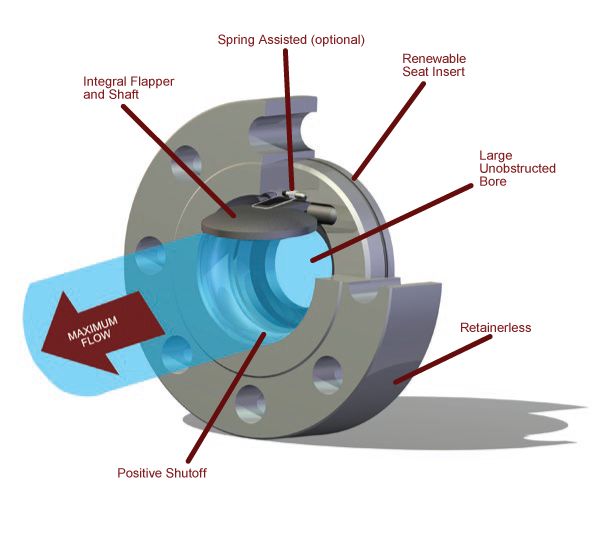 HY-GRADE check valves have a renewable seat insert for low cost and easy repair. HY-GRADE developed the WedgeSeal to improve metal-to-metal sealing. As shown, the WedgeSeal has seating surfaces which are machined at slight angles. As a result, positive shut off is obtained due to the wedging action of the sealing surfaces. Note, the sealing surfaces are machined only at slight angles to prevent the valve from sticking in the closed position in high back pressure applications. The WedgeSeal technology pioneered by HY-GRADE makes HYGRADE metal seated check valves excellent for both low and high pressure applications. A standard feature of HY-GRADE check valves is a retainerlass design. There are no external holes for shafts therefore there are no external leak paths or fugitive emissions. The design of the standard HY-GRADE check valve assures positive shut off under fire conditions and is certified to API 6FA and 6FD. Both soft seated and metal seated HY-GRADE check valves were tested by accredited independent laboratories at temperatures to 1200-1800Â° F and pressures up to 3750 psi. All the HY-GRADE check valves tested passed the external and internal leakage requirements. The API Fire tests also demonstrated that HY-GRADE check valves provide a positive shutoff after the removal of the resilient seating material as required by U.S. Coast Guard Category "A" and "Positive Shutoff" valves. Wafer Pattern - Series "T"
Lug Wafer Pattern - Series "F" or "L"
ANSI B16.10 Face-to-Face - Series "X"
Plastic Bodied Check Valve - Series "P"